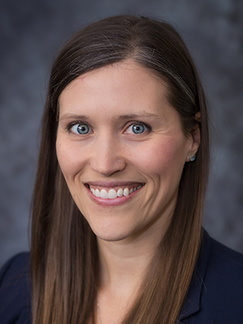 Andrea Westby, MD, joined the University of Minnesota North Memorial Family Medicine Residency Program faculty in 2017. Prior to joining faculty, she was a rural full spectrum physician including obstetrics in Perham, MN from 2012-2016. She practices and teaches full spectrum family medicine at North Memorial Medical Center and Broadway Family Medicine clinic, as well as teaching Essentials of Clinical Medicine and other undergraduate medical courses at the University of Minnesota Medical School. Her primary medical and research interests include obstetric and prenatal care, pediatrics (especially nutrition and development), community-based healthcare, practical nutrition and food justice, and eliminating health disparities, particularly around racial disparities and the use of race-based medicine.